If you're tired of villager then you can give him a piece of paper and it will return back to the village. If you are tired of the dog as a friend and you want to get the character of the same as you then download Villager Companion for Minecraft Pocket Edition (support for 0.17.0). After installation, you will be able not only to have a partner who is running for you. You will get a very useful companion that has a lot of features: you can give him items, trade with them, exchange with items and others! At the moment, it is the best add-on for those who are bored to play in single player mode of Minecraft PE 0.17.0. 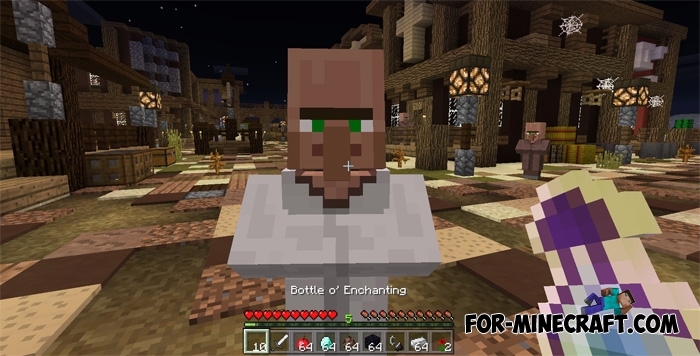 Villager Companion Addon contains 4 types of villagers, each of which is able to do something special. For example, a librarian is a great companion who can carry your items, follow you around, and exchange experience on the iron ingots. How to get a companion? Just go to the villager and give him the diamond. In order to give him things use a long tap on it. Then you'll see Inventory box, where you can move your items or take back. Remember: all the items will be lost after his death, so try to defend your resident or take with you most powerful of them. Also, after taming you can not run away from a new friend. There are two ways: your death or kill him. Download the file that is located below and extract. Then activate it (the menu to create or edit the worlds). World Edit Terra mod for Minecraft PE 0.14.0This massive mod adds the ability to edit the terrain of the world as you want. Its necessary your imagination to work of WE Terra! Toolbox v4.5.1 for Minecraft PE 1.10.0/1.11Toolbox (TooManyItems) is a popular app for Minecraft PE which facilitates the survival or your regular game. This mod (addon) adds a lot of features to the game..